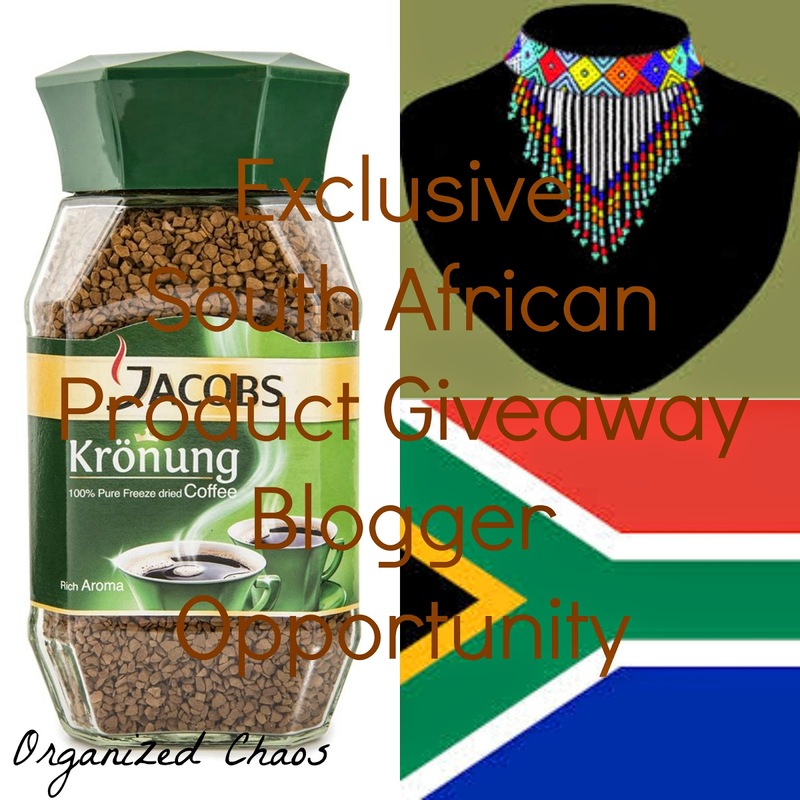 Blogger Opportunity with Organized Chaos! Shana at Organized Chaos is looking for some bloggers to help her out with her giveaway in July! Get a free twitter link in the giveaway with this Announcement Post! The first year of daycare is over! My little girl finished her first year of "school" and I can't believe it. I am foreveer grateful to the amazing teachers she had. She had grown and learned so much from them. Have you heard of Jack Rogers? If you like preppy clothes or you're on Instagram at all, you've seen them. Even if you don't know the company, you've seen them. Coming in at a whopping $110 a pair, they are a little pricey for some of us normal people. But of course, I love them. So imagine my surprise when I was at our local mall and stumbled across these dupes. The strap is a bit differant but I don't think you'd be able to tell. Our school's summer reading list is pretty awesome. So I obviously put them all (that I don't own) on hold at the library but what other books do you recommend I read this summer? I LOVE packages in the mail! And getting to know other bloggers is pretty awesome too. So whenever I see a swap that I'm interested in, I immediately sign up. I'm so glad I did! 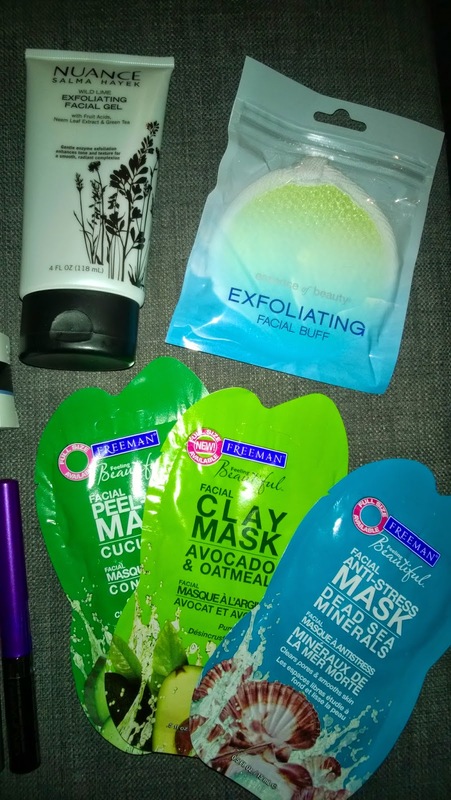 check out the amazing goodies I recieved! 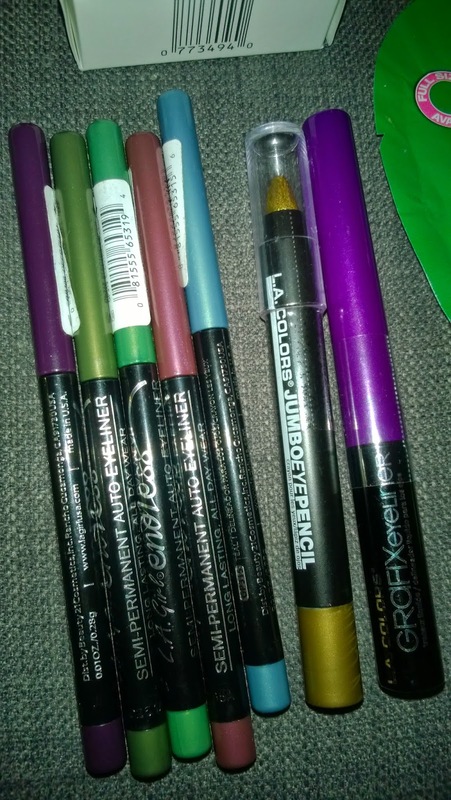 I've already used the nailpolish and opened up the purple liner! Love! 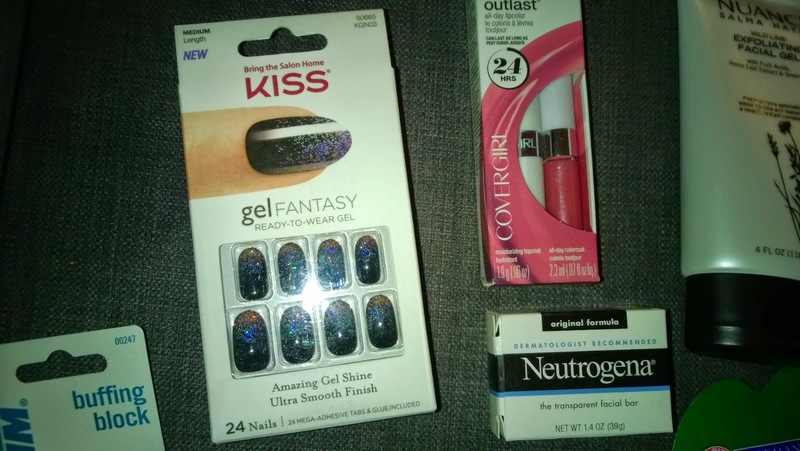 Jessica of Sparkles & Glue got me some really great products that I never would have picked up for myself! So glad I signed up for the swap on Southern Beauty Guide! Ps. 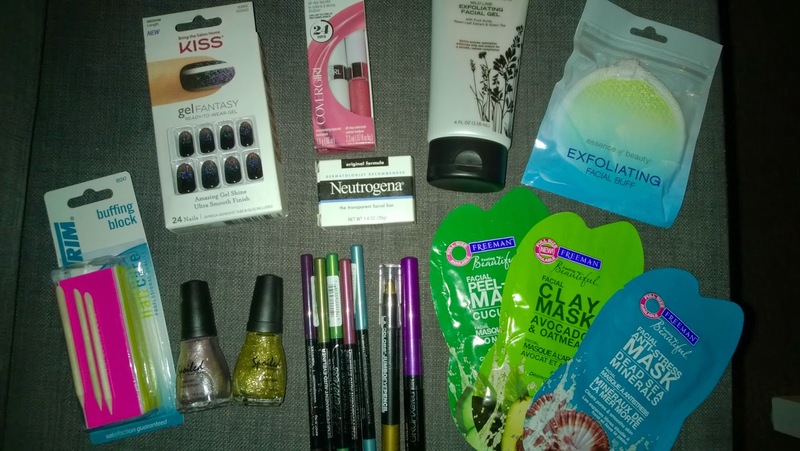 Check out what went into Jessica's package! One of the perks of being a Massachusetts teacher? Discounted admission at many of our amazing museums and historical places. The New England Aquarium even lets teachers in for FREE! It's usually $25 for a base ticket so that's a HUGE savings! The husband menioned he wanted to bring the princess so we figured we'd save even more money and borrowed the museum pass from our local library to cover him. Between me being free for being a teacher, and Emmalee being free because she is under 3, we ended up only paying the $10 discounted admission through our local library's pass! It would have been $50 for us to go if we hadn't had those discounts! We love the aquarium and this post is just going to be my photo dump from the day! Reflect Your Style With One Kings Lane! We've slowly been organizing the house. We've only been here two months so I'm okay with the fact that really the only two rooms that are done are the kids rooms. Our bathroom only needs mirrors hung and I want to install a growth ruler for the kids, but otherwise, done for now. The kitchen/living room looks nice. Not perfect, I know I want some other furniture and we need to hang pictures but it's presentable. Our bedroom is a mess. An absolute mess. bbut I'm finally tackling the closet! It's a semi walk in and there is a nice cut out that I could turn into a great vanity area for my scarves, jewelry, and make up. 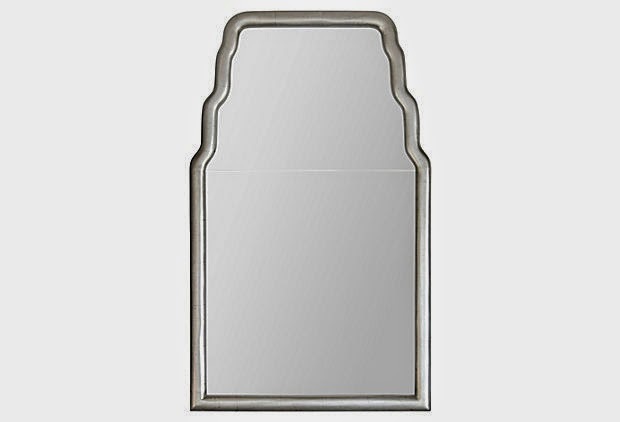 I started trolling the internet for inspiration and I was immediately drawn to One Kings Lane and the gorgeous mirrors they have! Especially the Lenoir Mirror. My house has a bit of a beachy nautical clean feeling and this would fit in perfect! Wouldn't it look amazing with these other items? One Kings Lane has amazing home items! I could decorate the whole house from their site! Also, I'm starting to think I shouldn't hide this prettiness in my closet! Disclaimer: I was asked by One Kings Lane to particpate in their Reflect on Your Style Program. All thoughts and opinions are my own. It's no secret that when we moved into our new house two months ago, the Princess' room was the first one to be decorated! And Little Man's was soon after! You can see the rooms here and here and then check out what Emily Creswick from Zillow has to say about the trending designs for kids rooms. 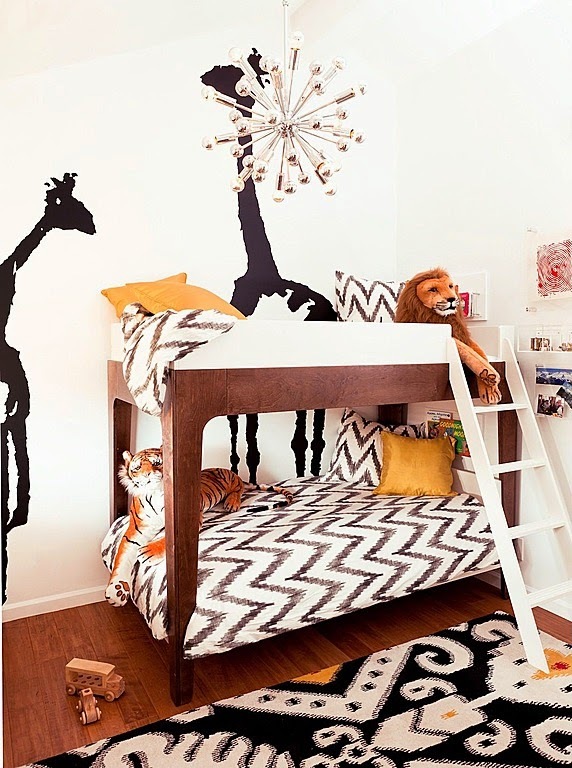 Designing a kid’s room is an exciting and imaginative task. The process allows homeowners to experiment with bold colors and more daring design trends to create an ideal haven for kids to learn, play and grow. Here are four trending themes to create a welcoming, fun and stimulating sanctuary for the little ones. Create an exciting and engaging room using a variety of colors and fun prints. Start by selecting a trending wall color such as creative orange or inspiring yellow and splash throughout the room by adding a colorfully-striped bedspread and matching window treatments. Add a block-colored rug and patterned beanbags to create an inviting and playful floor space. For a modern upgrade, incorporate a feature ceiling by adding decals in stars, polka dots and geometric patterns, or use paint to create a handcrafted ceiling design. Achieve this animal-loving theme by teaming light-grey or beige wall colors with dark wood accents or bamboo-style furniture pieces. Add a dramatic animal or tribal print rug and matching bed cushions. Bold prints are perfect for kids’ rooms as they easily disguise scuff marks and stains. Amongst the wild patterns, rooms tend to appear smaller, so keep the space bright and welcoming by selecting neutral-colored window treatments. Finish off by including bamboo or wicker baskets around the room for additional storage to keep the exciting features somewhat tame. Keep in mind that kids go through phases of adoring a single color, major trend or popular theme. One way to prevent expensive redesigns when kids change their minds is to decorate with timeless black and white décor. It’s a fresh look that pairs seamlessly with warm wood furniture, industrial metal features and pops of colored accents. Customize the space with printed accents, temporary decals or removable motifs to appeal to kid’s newest styles. Add a trending black and white geometric print rug and complement with white roman blinds. For a less dramatic look, use muted black and white tones such as grey and off-white balanced with pastel accents. Again, this basic design grows with kids and complements a youngster’s dream of a ninja turtle motif just as well as a teen’s ideal romantic Paris scene. Include interactive design elements to stimulate creative little minds. Decorate and educate simultaneously by framing a world map and inspiring travel posters. Create a cozy reading corner with a small bookcase and sitting poufs or pillow-laden teepee fort. For budding young artists, give them the ability to create daily masterpieces with chalkboard walls and drawing easels. When decorating a kid’s room, include elements that will grow with the child, such as a full-sized closet and functional furniture with extra storage. Avoid dramatic built-in features such as child-sized crawl spaces, hidden rooms and installed bunk beds. These features are exciting for kids, but extraneous for teens and wasteful square footage for adults. Consider the potential return on investment when it’s time to place the home on the market. Enhanced storage and simplified furniture layouts benefit family members at all ages and attract future buyers. Love the designs! Which is your favorite? 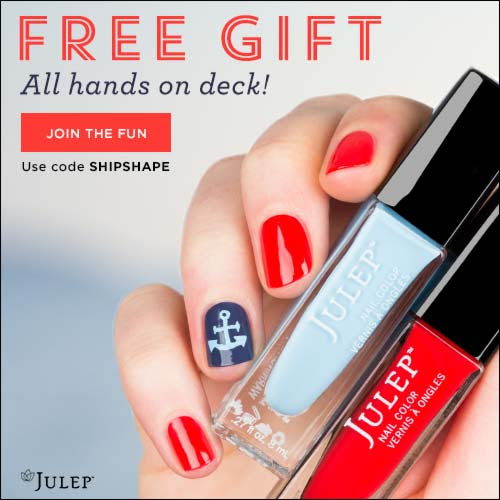 New Maven subscribers can get this limited edition Nautical inspired welcome box that includes 3 beautiful, bright nail colors, a lip gloss and our kajal eyeliner - a 5-piece set, valued at $80 - for free when they sign up for Julep Maven. Three. Three years old. Are you kidding me? It's amazing how fast little babies grow up into independent assertive little girls. I can't believe my little girl is three today so last night I obviously sat in her room pouring over her baby book, loking at every memory for when she was tiny. And then I realized I stopped updating that book pretty much this time last year, right after 2nd birthday. but I just don't have the time (or the set up) to do a book right now so I am jumping on the idea of the birthday interview. I'll do a page each year with these questions and see how her answers change each year! play outside on my "flayground"
Did you know this summer started 6 weeks early for me? The school I teach out lets out June 18th but delivering Tyler on May 6th meant I was done working as of May 5th! I feel like I NEED to take advantage of the extra time. Last summer we made a "Places We Want To Go" Bucket List and we actually went to all but 2 of the places! This year, we're going more generic and just planning things we want to do. We do a lot of the "go out for ice cream" and "go to the beach" so this might get us to go do something else! 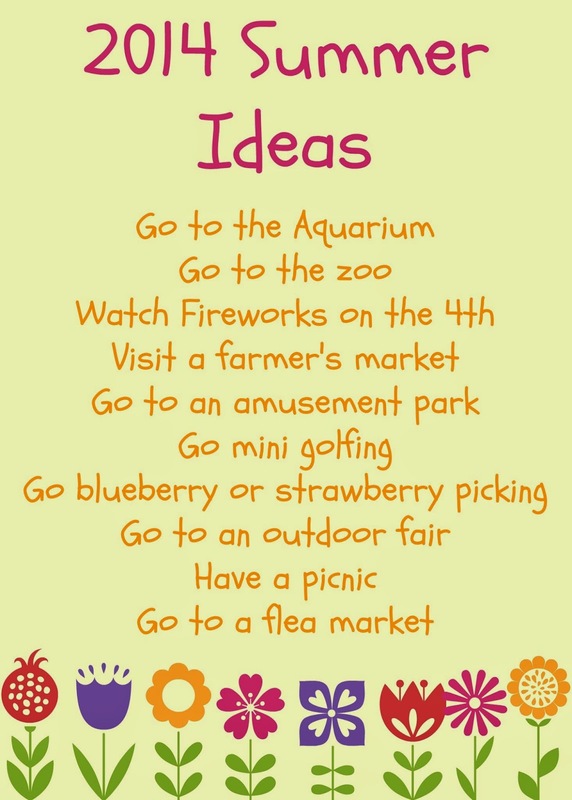 What's on your summer "must do" list? I have texture issues when it comes to food. I won't eat certain things becuase of the way they feel. This includes some jello, certain yogurts, even soups! I have to dump the liquid out of sour cream (or shake it so I don't even see it....). Anyways, I was hesitant to try the Yoplait Tasteoff because I tried greek yogurt once and I did not like it, but I went in with an open mind and figured a bite or two wouldn't hurt. 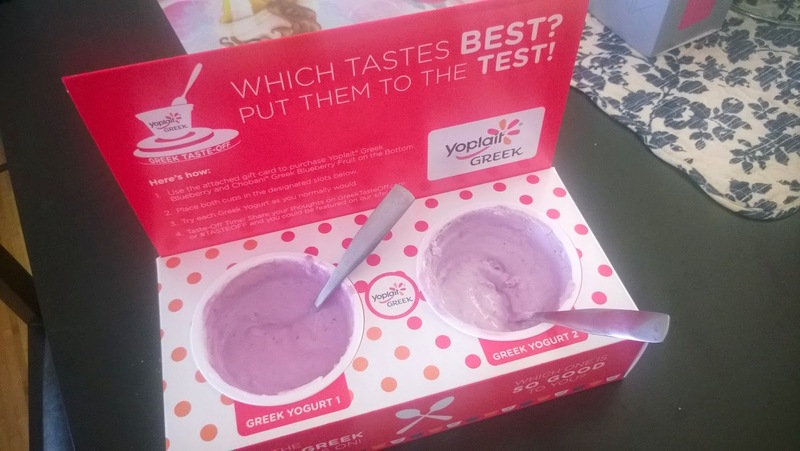 Klout sent me a #Tasteoff kit and I sent my husband to the store to pick up Yopailt and Chobani Blueberry Greek Yogurt. We peeled off the covers and popped them in the holder. I hesitantly took a bite of one and instantly tasted that sour taste I associated with greek yogurt the first time I tried it. Boo. And then had another bite. It was light, creamy and not sour! 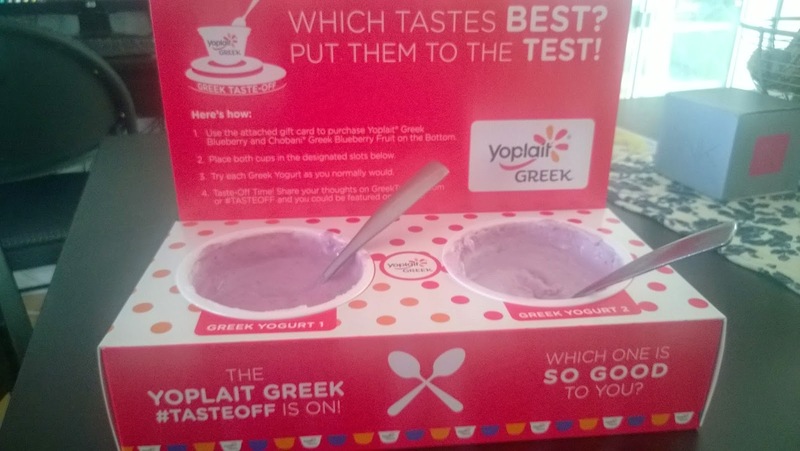 The Yoplait Greek was delicious! I ended up eating the rest of the container! And at 100 calories, I didn't feel guilty. 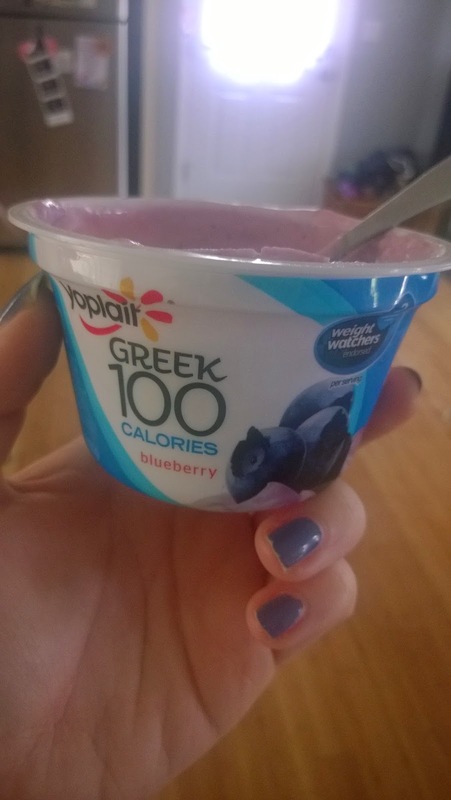 Have you tried Yoplait Greek 100? Did you have blueberry or strawberry? I can't wait to try more flavors! Disclaimer: I was offered this product complimentary from Klout. Father's Day is coming soon and I am always scrambling to find great Father's Day gifts for my husband and both of our fathers. Here's a few ideas I have and hopefully this guide can give you some direction of what to buy for the awesome dad in your life! My husband's personal favorite is issey miyake l'eau d'issey pour homme but you could buy him whatever his favorite is! Ebay offers thousands of differant brands and you could even pick up a couple for him to find a new favorite! My husband has been lusting for a fancy Movado watch for years. Father's day would be the perfect splurge for a watch this gorgeous! We're partial to the XBOX ONE but you could make your favorite dad smile with an XBOX or a Playstation gaming console. Most men like being the handy man around the house and this tool set could fix any and all problems around the house. It's like getting a microwave on Mother's Day, but still super practical. Doesn't matter what sport or what player, getting your favorite Dad a sports jersey is just what he'll want! We're partial to the Red Sox but there are TONS to choose from. Really go all out and grab Dad a set of tickets to wear his new jersey to! 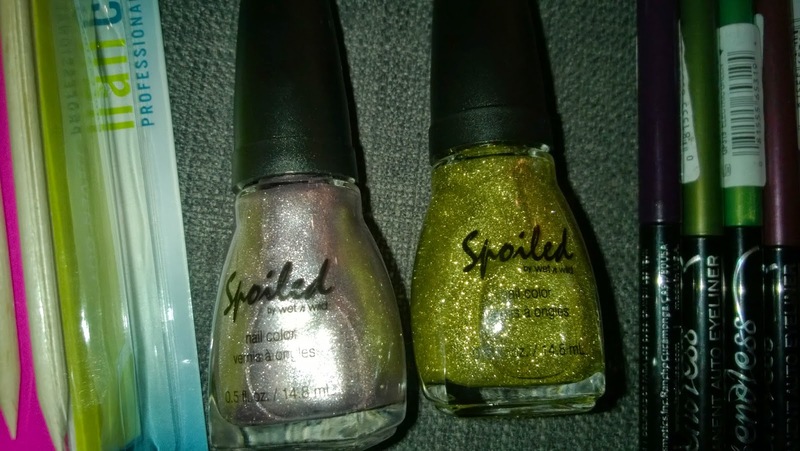 Disclaimer: This post was written for Influenster for Ebay. Look whose been with us for a full month already!? Our little man is a weed, always growing! 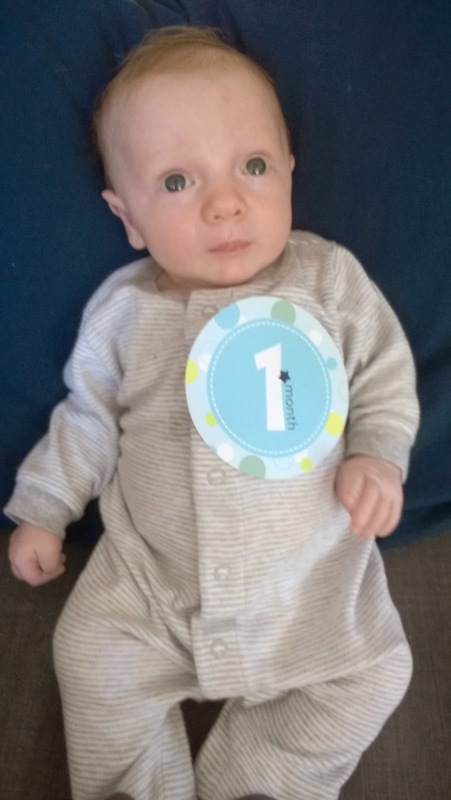 He's already 10 lbs 10 oz! 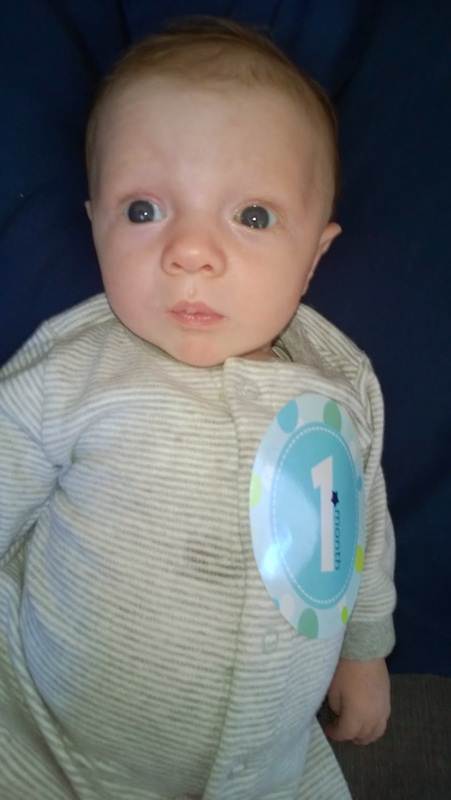 he was 8 lbs 6 oz at birth so that's an awesome gain! Additionally he grew 2 1/2" and is now 22 1/2 inches long! 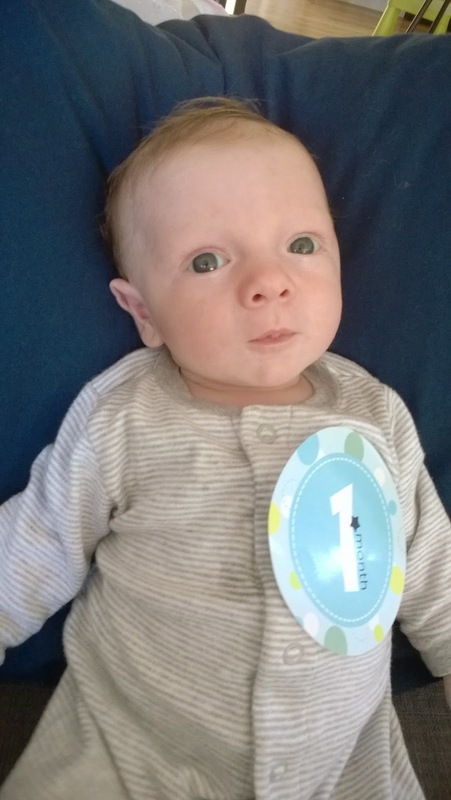 The doctor was super impressed when he found out he was breastfed and growing so well! He looks like David at times and Emmalee at times. He has my lips but he's mostly daddy. He's got the same ears and eyes as Emmalee, which were both inherited from their father. We have had three not so wonderful nights since he was born, but most nights he goes down around 7 pm and will sleep until about 2 am. Sometimes he wakes up around 11 for a quick feed but that's rare. After the 2 am feeding (which is usually 45 minutes!) he goes back to bed until about 7 am. He fights sleep during the day, he likes to be sitting up and seeing everything. Most of his day time sleeping is only 20-30 minutes at a time, unless he's in his swing or we're driving. Entirely breast fed still. He is great at nursing and I'm hoping we can go a full year like I did with the princess. 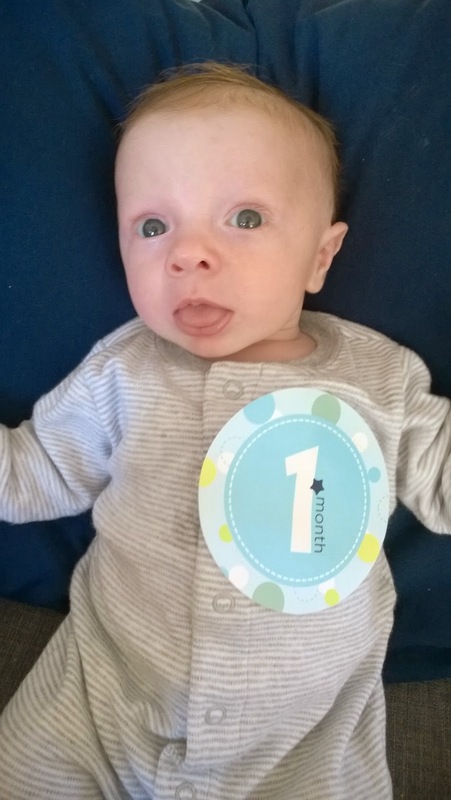 He had his first bottle on Wednesday. Em and I ran out for some errands and Dave gave him 2 oz in a bottle. Unlike his big sister, Tyler had no problem taking it! He just cries and grunts. Lifting his head requires a grunt. Kicking his legs around requires grunting. A diaper change or need for food warrants crying. Gas pain crying is the worst. He loves his swing! You could leave him in it all day if you wanted. And the sun. He loves being outside and if he's i his swing he turns his face to be in the sunlight. Otherwise, he pretty much just likes sleeping and eating. I am loving the late night nursing session. I'm sure I won't eventually (like when I go back to work) but right now, I love the quiet moments just watching what I made and seeing him grow from what I'm producing. It's pretty magical and I missed a lot of it with Emmalee, being stressed about whether or not I was "doing it right". I'm having a really hard time wrapping my head around my daughter turning 3!! 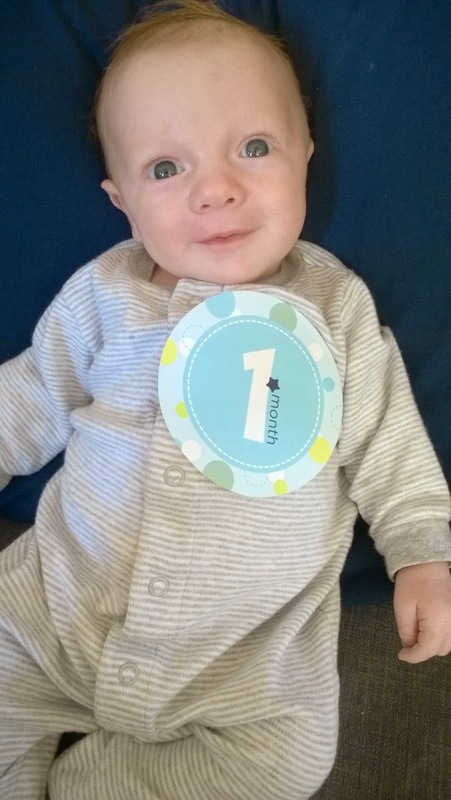 I was in the hospital giving birth to Little Man during the ideal birthday planning time. However, when I got home and took a few days to settle, I realized her birthday party should be in less than a month and I hadn't planned a thing! Have you met Callie yet? She's a completely adorable cat sheriff who helps her friends learn to be nice, be honest, and all the other feel good things you want your kid to learn. She's also super new so there's NOTHING out for her yet. No shirts, no partyware, nothing. So I turned to Etsy. 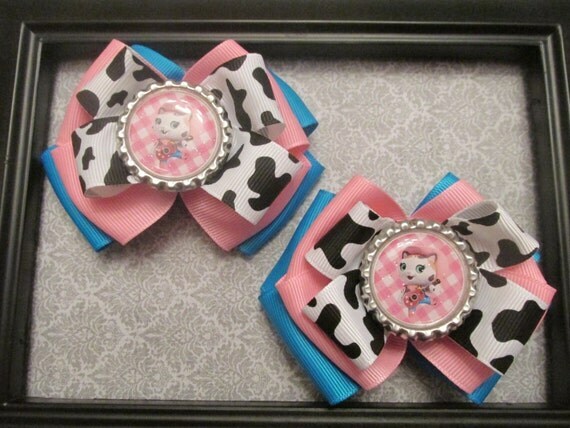 I found the most adorable Sheriff Callie bows and had to get them for her! The Black Dahlia Dog shop is just perfect! Great price, quick shipping, and she even included a bottlecap necklace with a Sheriff Callie insert for free! Emmalee hasn't taken it off in days. If you have a little girl, you should absolutely check out the Black Dahlia Dog shop on Etsy. Oh, and no... this isn't sponsored, I just LOVE the customer service and the bows from this shop! Emma's birthday is next week and we thought long and hard about what to get her for a present. That's a lie. We knew exactly what we wanted to get her but I had to convince myself not to buy all the other gifts too! We had a big wooden one at the house we used to rent and Emma has missed it big time since moving here! We didn't want to get a huge swing set and this seems like the perfect size for our yard and for her. So the real question is what didn't make the cut for birthday gifts? 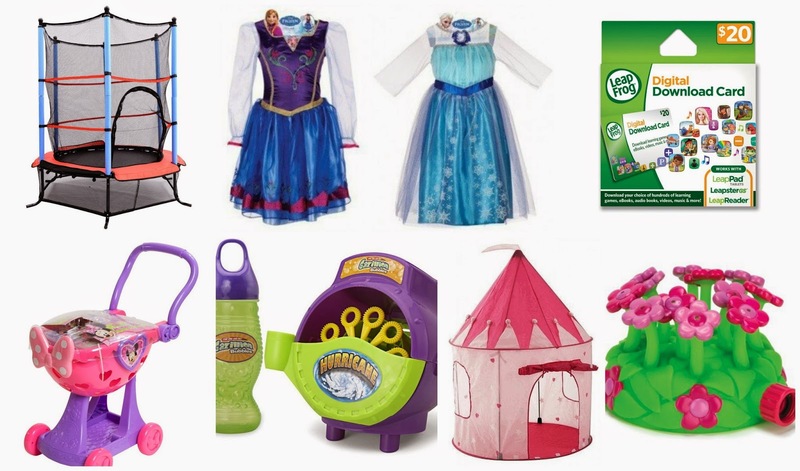 Honestly, any of these would be perfect for a three year old girl. Think I made the right choice?